What’s the Right Choice for Your Child? It’s all good that parents want to keep their children active outside of school in order to promote health. But what’s the best choice? An extracurricular team sport? Or Martial Arts? Although either one will encourage kids to be active and get healthy, the evidence seems to weigh in for martial arts. But read on and judge for yourself. Team sports can be wonderful for their camaraderie and teamwork, and generally provide great cardiovascular workouts. They also often encourage kids to learn how to keep and manage a schedule. And for highly social children who need a lot of interaction with other kids, sports may provide the right choice. But let’s look at some comparisons of the two to help decide what’s the right choice for your child. One of the chief benefits of martial arts of course, is that kids will learn self-defense. Students are taught how to get out of confrontations without throwing a punch or kick, particularly useful skills these days with all the incidences of bullying. And, if they are attacked, they will have valuable defense skills to employ. Martial arts helps build self-confidence in a healthy way. Goals are met in a non-intimidating environment, an environment where the emphasis is on individual achievement. There is no pressure to do well for the good of the team; instead children may advance at a level that is comfortable for them. When they do achieve, they are awarded at each step with a belt, which is no small matter. The first one can be achieved in as short a time period as a few weeks. Children who achieve that first belt realize that they can succeed! This surge in their self-confidence leads to achieving the next belt, and the belts and rankings motivate them to continue to strive for more success while their confidence level soars. In team sports, there is often a steep learning curve when a child is new to the sport. This can mean a lot of time sitting on the bench instead of playing, as, obviously, the coach’s goal is to win. The child left sitting on the bench can get bored, or discouraged, and quit the sport. And their self-confidence can take a beating in the process. The flip side of the coin is, what happens when children are really good at a team sport? They play it and love it, and then they graduate school and what happens? Unless they are so good that they become professional players, they have probably just lost the sport they loved. Martial arts is something they can continue to practice for a lifetime. Sports are seasonal. When the snow melts, there is no more skiing. When soccer season ends, it’s over for the year. Martial arts? The season never ends. It’s always there when it’s wanted. Another benefit that most people are not aware of is, the martial arts are something you can do with your kids. Family classes are available so parents and kids can train and learn together. Of course, this is assuming you don’t have teenagers! Armed with this information, and knowing your own child, you can now make it an informed decision. 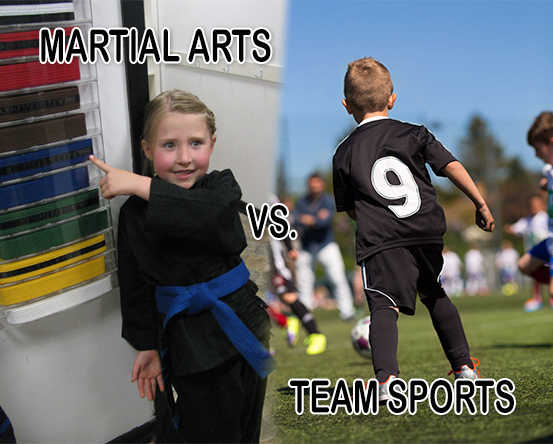 Which will it be, a team sport, or the martial arts?